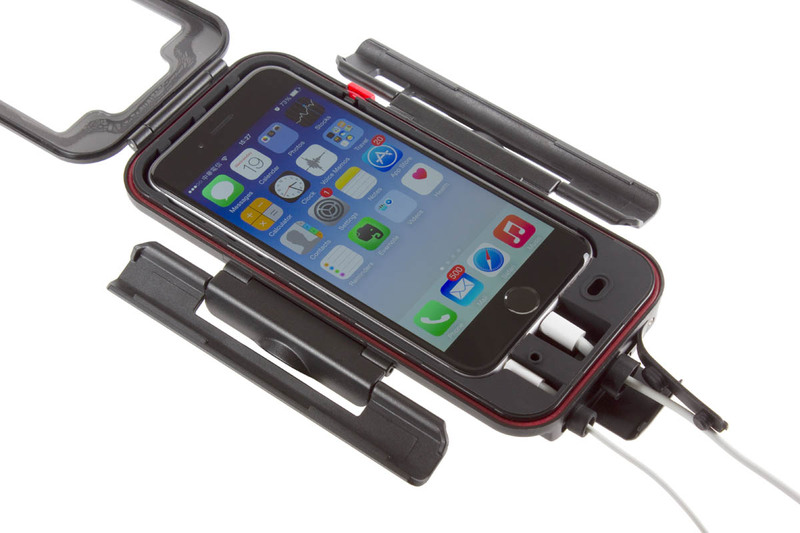 BioLogic has released a new version of its Bike Mount Plus system that is compatible with Apple’s iPhone 6. The kit features an ABS plastic hard case designed specifically to fit the iPhone 6, and comes complete with a silicone liner to further prevent your phone from being damaged by vibration or knocks. The case is designed to allow you to use its entire set of features, and the touchscreen can be accessed as normal through the case. There are holes in the casing to allow the attachment of charging cables and headphones, plus there’s a channel to allow sound to escape from the speaker so that you can still use the phone in hands-free mode. All holes can be sealed for weather protection. The case is mounted securely on a bracket, which allows the phone to be rotated portrait or landscape orientation. There’s also a neat arm that can be flipped out of the back of the case so you can prop the case and phone up on a flat surface. No UK retail price has been announced, but the similar BioLogic Bike Mountain Plus iPhone 5 case currently retails for £40 so we would expect something along those lines. In addition to its range of phone cases and mounts for bikes, BioLogic has produced a free BikeBrain app that turns your iPhone into a fully functioning GPS bike computer.